This paper presents a novel idea of automatic fault localization by exploiting counterexamples generated by a model checker. The key insight is that, if a candidate statement is faulty, it is possible to modify (i.e. correct) this statement so that the counterexample is eliminated. 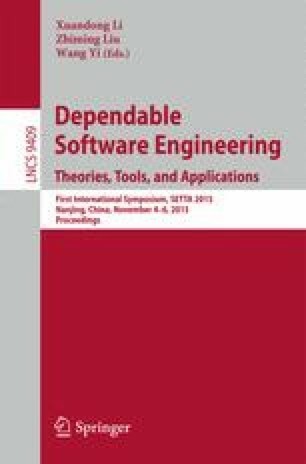 We have implemented the proposed fault localization algorithm for component-based systems modelled in the BIP (Behaviour, Interaction and Priority) language, and conducted the first experimental evaluation on a set of benchmarks with injected faults, showing that our approach is promising and capable of quickly and precisely localizing faults. This work was partially funded by National Natural Science Foundation of China (61379054).